The unassumingly named CRISPR/Cas9 is a technology that stands to remake the world as we know it. By allowing scientists to more easily than ever cut and paste all those As, Cs, Ts, and Gs that encode all the world’s living things, for one thing, it could one day cure many devastating diseases. All that power, though, comes with one pretty sizable caveat: Sometimes CRISPR doesn’t work quite like we expect it to. While the scientific establishment is still embroiled in a debate over just how serious the problem is, CRISPR sometimes causes off-target effects. 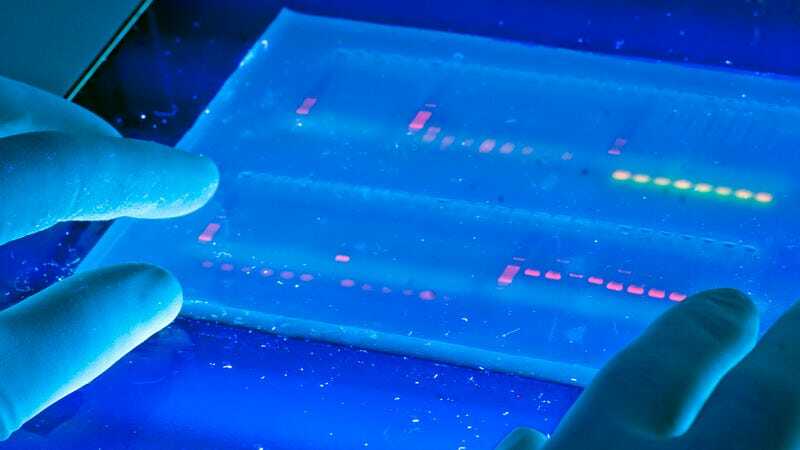 And for scientists doing gene editing on human patients, those mutations could wind up inadvertently causing problems like tumors or genetic disease. Yikes. A new study from the Salk Institute suggests an interesting workaround: If we’re trying to change a gene’s behavior, why do we need to actually edit it at all? In a paper published Thursday in the journal Cell, the Salk scientists suggest doing something else entirely. Instead of using CRISPR/Cas9 to cut apart strands of DNA to either remove genes or insert new ones, they instead used CRISPR as a switch that simply turns genes on and off. Think of it as CRISPR disarmed. The function that guides the CRISPR system to a precise location in a genome is still there—it’s just missing the scissors. Instead, molecular switches are used to turn specific genes on and off. The resulting changes aren’t genetic—they’re epigenetic. Taken literally, epigenetic means “above the gene.” The epigenome tells a genome what to do. By modifying the epigenome, it’s possible to control how a gene behaves without actually modifying any DNA directly. It’s sort of like gene editing, without actually doing any editing. To accomplish this, the Salk scientists relied on what’s known as a “dead” form of Cas9. In the CRISPR system, the Cas9 enzyme is what actually does the cutting. But its dead version doesn’t cut. The trouble was that dead Cas9 is pretty bulky. When working in animals or people, a virus is typically used to deliver the CRISPR system. But their new system was too big. So the researchers cunningly split their package in two, loading one virus up with the guide feature and another with those molecular switches and the guide RNA that finds and targets the appropriate gene. It worked. Working with mice, they were able to reverse the disease symptoms of kidney disease, type 1 diabetes, and a form of muscular dystrophy. In the mouse with kidney disease, for example, they turned on two genes associated with kidney function and saw the kidney function improved. “It provides a proof-of-concept that this system might be adapted to treat human diseases in the future,” Liao and Hatanaka said. The Salk scientists are not the first to use CRISPR to “edit” the epigenome. But this new work pushes past the petri dish to demonstrate how the technology works in animals. Curing diseased mice is a step or ten away from curing disease in humans, but it’s a significant step in a very promising direction.